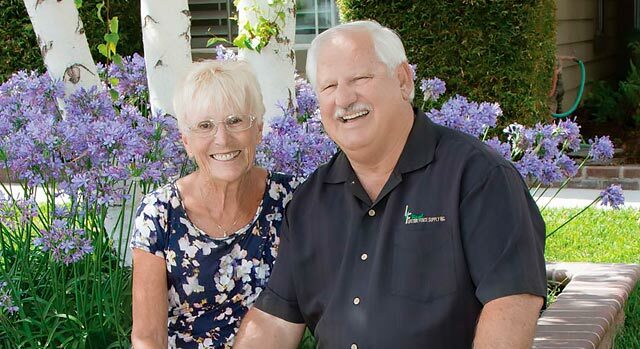 Don Garling, First Vice Chair on the Corona Chamber of Commerce board of directors and a leader in Corona's Rotary, is pictured with his wife Sally. Don is "back to his old self" after emergency treatment in Corona Regional's EP Lab/Cath Lab in 2014. Don Garling had been feeling disoriented and dizzy on October 15, 2014. His wife, Sally, urged him to go to the hospital and when he arrived, his heart was racing at 240 beats a minute – about 174 beats above normal. The diagnosis was arrhythmia, an irregular heartbeat caused by heart disease, aging, a birth defect or high blood pressure. Complications can range from stroke to sudden cardiac arrest and can cause death if not treated in minutes. Don was taken to the Electrophysiology/Cardiac Catheterization (EP/Cath) Lab at Corona Regional. There he met Truong Duong, MD, an electrophysiologist. "You could see Dr. Duong’s excitement," Don says. "He told Sally and me, 'I know what’s wrong and I can fix it.' I immediately felt comforted by his presence. I felt his compassion for people as he talked in detail about my condition and the procedure that I believe saved my life." Dr. Duong placed an implantable cardioverter defibrillator (ICD) just under the skin in Don’s chest. The ICD helps regulate the heart with tiny electrical pulses. In a matter of months, Don was playing volleyball in the pool with his four grandchildren. "I thank God every day for Dr. Duong’s commitment to his profession, his desire for excellence and people skills," says Don. "Because of the care I received at Corona Regional, I am alive and well, doing what I love most—enjoying my family and friends, gardening and golfing."